My pantry is full of half-open bags of candy. Once things start falling on my head while I’m grabbing the cereal, I know it’s time to take action. 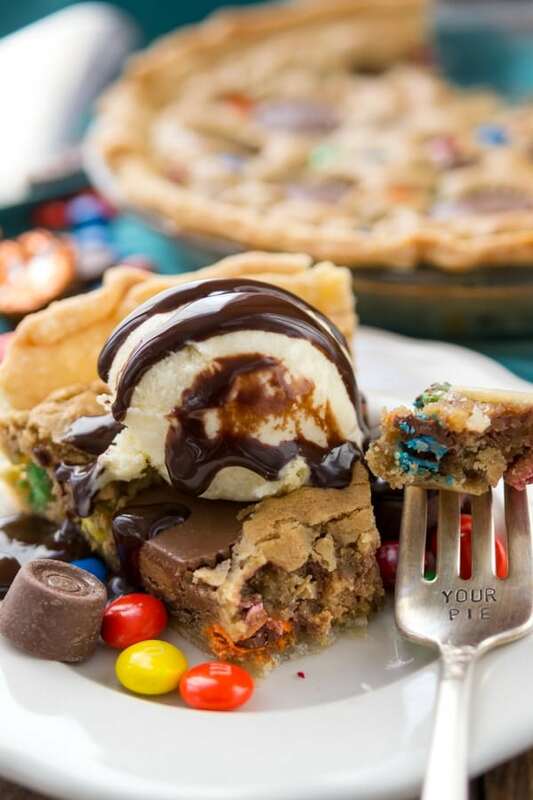 Enter: Candy Bar Pie. 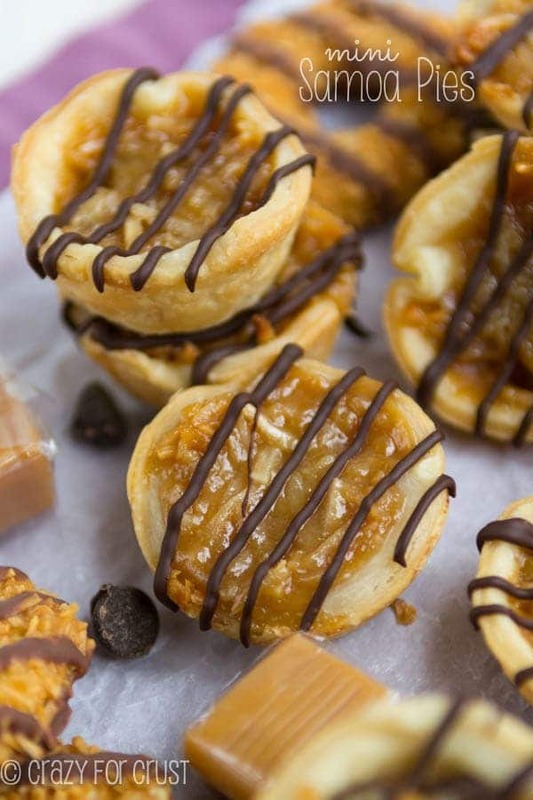 A blondie in a pie crust that’s filled with leftover candy. I say this a lot, but you’re welcome. Like a lot of Americans, we have a second freezer. It’s in the garage and it’s full of frozen chicken breasts, frozen vegetables, and lots and lots and lots of baked goods. The irony of the fact that we originally purchased the freezer because my husband was doing Weight Watchers and needed space for all the meals is not lost on me. The meal space is now the stocked-for-dessert-armageddon space. I really, really want a second refrigerator but we haven’t figured out the expense (or where to put it) yet. My husband routinely complains he needs space for “his stuff” in the refrigerator. I told him to buy me another refrigerator that we could use for his stuff and extra juice boxes and Jordan’s yogurt drinks…but that probably the first time we had a party or a really heavy baking day I’d end up taking over that one too. Recently, the pantry has been expanded into the garage too. And then it was expanded again into the storage room in the garage. And it’s still overflowing because the other day a bunch of candy attacked me when I was looking for Goldfish. Literally – they fell out and hit me on the head. I decided it was time to do something about the “open bags of candy problem”. 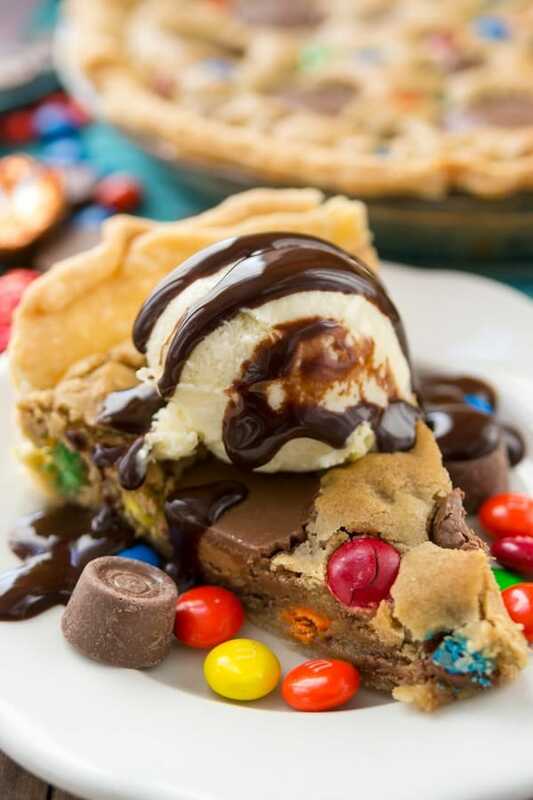 Enter: candy bar pie. …or you have a whole bunch of Halloween Candy staring you in the face – before or after the big day. Right? Everyone has that problem. What do you do with the candy? The answer to where the candy goes? Into a pie. After Halloween comes the pie holiday (my favorite!) and this is going to be your new favorite recipe for pie. 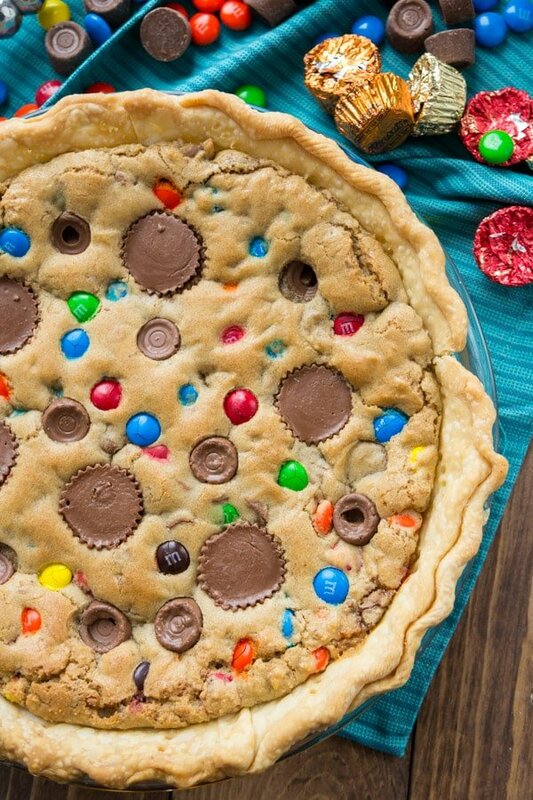 This pie is basically a giant cookie in a crust, filled with candy. I used my favorite blondie recipe, which is the same recipe I used the last time I cleaned out my pantry and made Loaded Cookie Bars. The blondie is gooey and rich from a ton of brown sugar. The batter stays soft even after it’s cooked! I put this into a refrigerated pie crust (I’m all about the easy) but you could use a homemade pie crust. I’ve done that before with cookie pie, when I made a peanut butter cookie pie for Easter a few years ago. A note about the crust for this recipe: make sure that your crust is firmly pressed to the sides of your pie plate. The blondie batter only fills about half the plate and it grows to fill the crust. You don’t want the sides of the pie crust to collapse. To combat this problem, I made sure that the sides were pressed firmly to the pie plate and I pressed the sides that showed (after adding the batter) with the tines of a fork a few times. Once you have your blondie batter all mixed up, you just need to add your candy. This is where it gets fun: just add what you like, or what you have hanging around your pantry. Just look through your pantry, dig through your kids’ treat bucket and pull out what you love. If you’re using a stand mixer to mix up your blondie base, you don’t need to chop small or mini candy (like the miniature Reese’s or Rolos). Just add them to the batter and mix on medium. The paddle attachment and power of the mixer will chop up your candy for you. If you’re using bigger size candy (like regular size Reese’s or fun-size Almond Joy or Kit Kat) you’ll want to coarsely chop it before adding it to your stand mixer. If you’re using a hand mixer or mixing by hand, you’ll want to chop up any of the candies you use. Just make sure to reserve some for the top of the pie. Like when you’re making cookies, they come out prettier when you press some candies on the top. Pick a few of each kind of candy and gently press them into the dough before baking. Then try and wait until the pie is cool to slice it. And maybe top it with ice cream and chocolate sauce. Because you can, obviously. 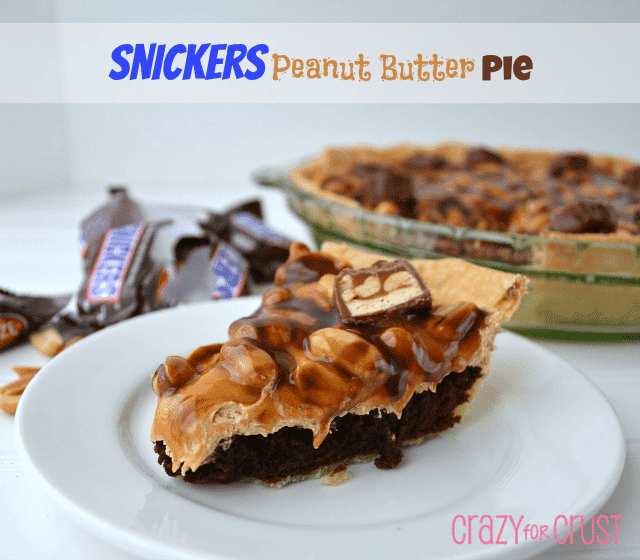 This Candy Bar Pie is great for using up any leftover candy you have in your pantry. 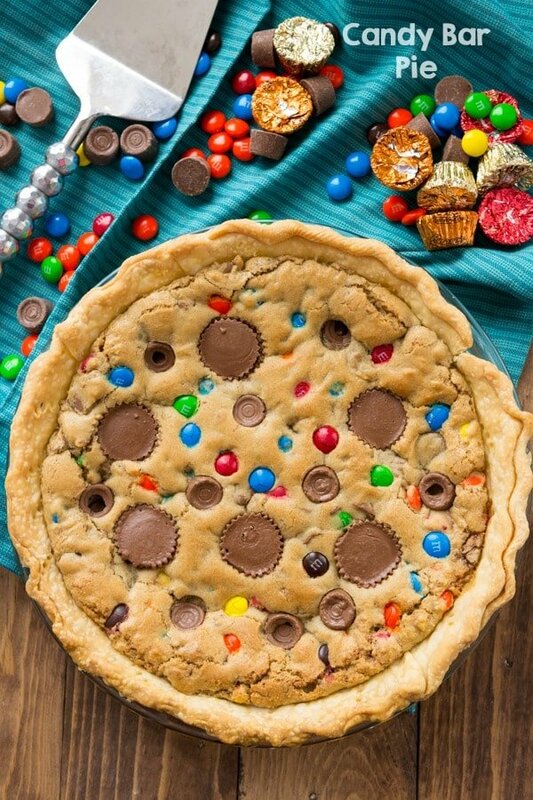 The base of the pie is a giant blondie and you simply fill it with your favorite candy, like peanut butter cups, Rolos, and M&Ms! Place pie crust in a 9” pie plate, crimping as desired. Press the sides of the crust so they are firmly attached to the edges of the pie plate. Cream brown sugar and butter in the bowl of an electric mixer fitted with a paddle attachment (or you can use a hand mixer). Add eggs and vanilla and beat until combined. Add baking powder, salt, and flour and mix. If you are using a stand mixer, add your candy bars to the bowl and mix on medium-high to chop of the candy. (The strength of the mixer is enough to break up soft pieces of candy, like Reese’s or Rolos.) If you’re using a hand mixer, coarsely chop the candy, the mix it into the dough. Press into prepared pan (dough is sticky, spray your hands with cooking spray to avoid it sticking to your hands). Press some remaining candy on the top for decoration. Press the sides of the crust that are showing with the tines of a fork a few times. Bake for about 24-30 minutes, until the crust is browned and the top of the pie is golden. It may still be a little jiggly in the center. Cool completely before cutting. Serve by itself or with whipped cream or ice cream. This seriously looks delish! Ive never been much of a crust eater….I make a mean apple pie…I just don’t eat the crust. Will it cook the same if I just poured it in a pie plate with out the crust? You don’t eat the crust. !!!!! 🙂 Kidding. Yes, you can make this in a pan for sure. It’s just my basic blondie recipe! It’s probably an 8×8 pan size! Or just use the 9″ pie plate without the crust. Enjoy! Does anyone know the calorie count on this? Um, way too many? I don’t calculate the calories on my recipes (I really don’t want to know) but I know spark people has a counter you can use! Would dark chocolate covered dried pomegranates be alright to use? And we love all your recipes. 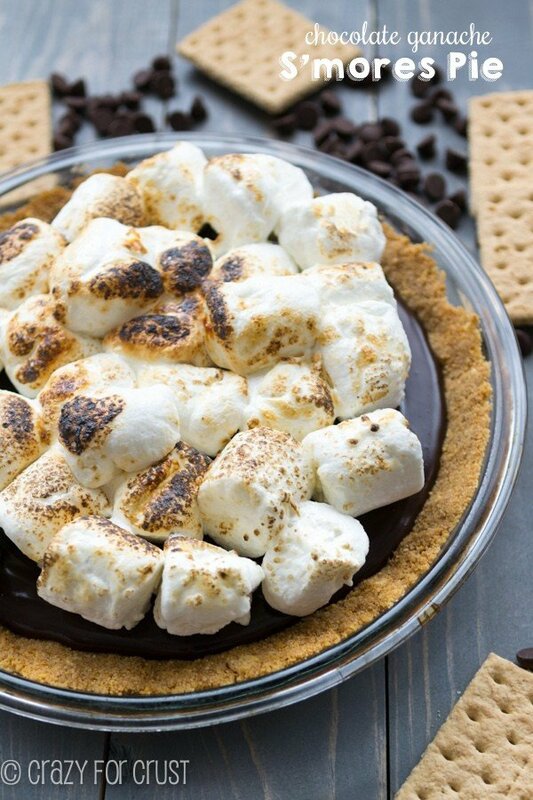 I think you can add anything you love to this pie, just like chocolate chip cookies. Those sound fabulous!! Enjoy! I made this for a party this weekend and blew some minds! absolutely delicious. I have made this pie 3 times now. I thought by using the Graham crust caused it to not cook all the way through. I used a refrigerated pie crust and the same problem: It is doughy throughout. I had to turn the oven back on and put it back in. What am I doing wrong???? I bake it for about 28 minutes. I don’t want to burn it. Did you wait for it to cool? Once mine cooled it solidified. It might just need to bake longer; if the crust starts to brown too soon you can cover it with foil or a pie shield. I bought a frozen pie crust that already comes ina is tin. Would I defrost it first and do I pre-bake that first before adding blinder dough? Help! I’d like to make this tonight. You will bake it all together (crust and mixture) in the oven. Check the package though if it should be frozen or thawed going into the oven; there will be directions for “filled pie”. Hershey’s Kisses, Dark Chocolate M&M’s, Mini Rolos, Mini Peanut Butter Cups & would it change the 1 Cup amount, or any of the other ingredients? Thank you!